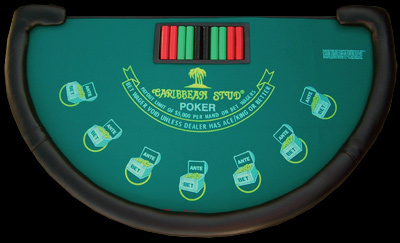 Caribbean stud poker is a casino table game with rules similar to five card stud poker. However, unlike standard poker games, Caribbean stud is played against the house rather than against other players. There is no bluffing or any other deception. To play, every player places his ante on the layout where indicated; all ante wagers must be placed prior to the dealer announcing "No more bets". Each player and the dealer will then receive 5 cards, face down. The dealer will turn over one of his cards, then push the cards toward the players, after which the players may look at their cards. They may only look at their own cards, and may not discuss what they have with any other player at the table. Players have the option to play or fold; if they choose to play, they place their bets (twice the amount of their respective ante) in the bet box. If they choose to fold, they forfeit their ante. After all the players have made their decisions, the dealer reveals his hole cards. The dealer only plays with an ace/king or higher; he then compares his cards to the players' cards (individually, right to left), and the best poker hand wins. Only one hand per player. Players cannot hold or wager on multiple hands at the table. Players choosing to play the Progressive Payout feature are responsible for ensuring their $1 wager has been inserted into slot and the "Indicator Light" is ON. Players may not exchange or communicate information regarding their hands to other players or the dealer. Violation will result in a dead hand and forfeiture of all wagers. Incorrect amount of cards to the player constitutes a dead hand for that player only. The decision of the table/casino supervisor is final. If the dealer is dealt four cards of the five-card hand, the dealer shall deal an additional card to complete the hand. Any other misdeal to the dealer shall result in all hands being void and the cards shall be reshuffled. Each player shall be required to keep the five cards in full view of the dealer at all times. Once each player has examined his or her cards and placed them face down on the layout, they may not touch the cards again. If a hole card is exposed prior to the dealer announcing "no more bets", all hands shall be void and the cards shall be reshuffled. If the dealer does not have at least ace/king, all bet wagers will be void, and players will receive even money on their ante bet only. If the dealer's cards beat a player's cards, the dealer collects both the ante and bet. It uses material from the Wikipedia article "Caribbean Stud Poker".